MILWAUKEE The new Digital Touring Suspension Air Pump (P/N 54000033, $69.95) from Harley-Davidson® Genuine Motor Accessories® is an accurate and convenient tool used to check and alter pressure in the rear air shocks on all Harley-Davidson Touring motorcycles. 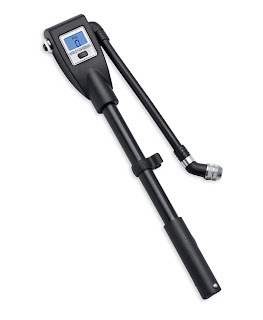 The only digital suspension air pump on the market, it has a bleed valve that allows precise adjustment of air pressure, and the "no loss" connector maintains shock pressure when the fitting is removed. A pivoting pump handle provides improved grip while adding air to shocks. This compact pump fits in a travel bag and can also be used to measure tire air pressure. Display units can be changed between PSI and KPa. The LCD readout operates on a long-lasting, replaceable lithium coin-type battery.